If you’re always on the lookout for a bargain, this is your golden age. An entire cottage industry has sprung up around the concept of the daily deal—a limited-time offer that allows you, the crafty consumer with one eye on the bottom line, to shave some bucks off a price tag. Websites, email alerts, and even dedicated businesses now serve up an array of buy-one-get-one-free, half-off, and free-with-purchase offers. Just one problem with this surfeit of savings—how do you keep track of all these deals? BiteHunter thinks it’s come up with the solution, at least for bargain hunters with empty stomachs. The company’s self-titled iPhone app aggregates real-time dining deals from a multitude of sources, letting you access a list of deals in your immediate vicinity directly from your iOS device. BiteHunter works more or less as advertised, but not without some hiccups along the way. Deals on Meals: By default, BiteHunter uses a map view to show you potential discounts offered by restaurants in your area. 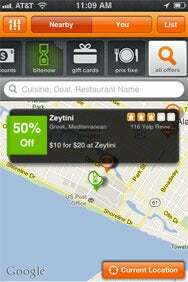 The app collects deals from such noteworthy services as Groupon, LivingSocial, Yelp, Restaurant.com, and others. A scrollable menu bar lets you filter between daily deals, discounts, gift cards, prix fixe offers, and the like, though I found it best just to have the app show me all offers regardless of category. BiteHunter uses your iPhone’s location capabilities to find deals in your area, which is easily the best use of the app. You can, however, search for deals in specific areas by entering in a location on the app’s settings screen—useful, I suppose, if you know you’re going to be in a different city later that day and want to see if there’s a restaurant offering a good deal. The app’s location-centric capabilities work best when you’re connected via Wi-Fi; otherwise, it may think you’re a few blocks away from where you actually are, though that isn’t exactly a critical shortcoming. By default, BiteHunter lists its results on a map to show where deals are in relation to your location. You can, in theory, zoom in for a closer look—helpful if multiple nearby businesses are offering up a deal—or zoom out to cast a wider bargain-hunting net. I say “in theory” because the zooming and panning in the map view isn’t as smooth as it should be. I’ll zoom in to get a better view, but once I finish the pinch gesture, the map will reload and shift ever so slightly so that the area I’m zooming in is no longer at the center of the screen. Using the map is so frustrating, in fact, I found myself turning to BiteHunter’s list view; while not as helpful in showing precise locations of eateries offering deals, it at least lets you scroll without a pause or a reload. To get the details of a deal, you tap on an icon in the map view or the listed deal in the list mode. That takes you to a page that shows you the specific offer—$10 for $20 worth of food at an Italian restaurant, say—along with buttons to redeem the deal, save it to a list, email it, or share it on Facebook and Twitter. 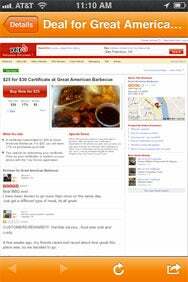 Scroll down, and you can find some additional information about the restaurant—its address along with a directions link, links to Yelp reviews, and a tappable phone number and website link, if available. Some entries also contain menu information. That’s one of my biggest complaints with BiteHunter, actually. While the app does a decent job of telling you what deal is available, it’s pretty stinting with details about the restaurant itself. That’s not an insignificant piece of information—a deal isn’t much of a bargain if it’s discounted food that you aren’t going to like. You can find that information in BiteHunter, but not without a lot of tapping back and forth. An app that’s trying to make it more convenient to find deals should take that convenience to the next level by offering more easily accessible restaurant data. BiteHunter is taking some positive steps in this regard: It recently partnered with LocalEats, which makes one of my favorite restaurant-finder apps, to include the latter’s restaurant summaries in its bargain-hunting app. Still, not a lot of the restaurants offering deals during my testing have been vetted by LocalEats, so I was unable to reap much of a benefit from that partnership. Read the Fine Print: Not every redemption page within BiteHunter’s in-app browser is optimized for mobile devices. Another complaint: Once you tap the Redeem button to cash in on a deal, the subsequent page isn’t always rendered consistently on your iPhone. Deals from Groupon, for example, are perfectly formatted for a mobile device; Yelp’s offers, in contrast, are presented on a normal-sized Web page, requiring a lot of pinching and panning to read the fine print. This isn’t necessarily BiteHunter’s fault—its in-app browser appears to be at the mercy of whether its partners have optimized for mobile Web browsers. Still, who’s responsible for making a site look pretty is of little matter to me when I have to strain to see the details on a Web offer. The app can be somewhat hit-or-miss with its coverage, though again, it’s at the mercy of deal sites. At my office in San Francisco or my house in the East Bay, the app can find plenty of meal deals. In another Northern California suburb—one teaming with a wide variety of restaurants, I might add—the only deal that popped up was one for artisan olive oil tastings. On a road trip to Monterey, a search in the restaurant-centric Cannery Row area found only gift certificate offers. Another search in Gilroy, Calif.,—not a major metropolis, true, but not exactly a barren wasteland, either—I couldn’t find any deals. My point: If you are counting on BiteHunter to find out where your next meal is coming from, you might wind up going hungry. There’s a solid idea behind BiteHunter, and anyone who’s embraced the daily deal ethos will likely overlook the app’s errors in execution for the convenience of having all their dining bargains aggregated into one app. The app needs to tidy things up a bit, though, before it can be a deal finder for the rest of us.